Those adorable bears from Bears on Chairs return in an irresistibly sweet bedtime story. It's time for Big Brown Bear to tuck all four little bears into their beds. Then he's ready to climb into his own bed and turn out the light. Five warm beds, holding five sleepy bears, until a sound goes whoosh in the middle of the night, and all the bears wake up in a fright. Will they ever get back into bed? Luckily, Big Brown Bear knows just what to do! A fun, rhyming read-aloud that parents will love and tired little cubs will be happy to snuggle up with. A great story for new readers who want to practice their skills by reading aloud to their younger siblings. Easy to read and a breeze to memorize, these little bears will soon be part of many a bedtime routine. Little bears who are afraid of storms or who have trouble sleeping will want to cuddle up with these five friends. --Kirkus Reviews Gentle rhymes and soothing, sherbet-colored artwork will put toddlers at ease and help them sleep soundly. ... Children will love pointing out the details in repeated readings. --Twenty by Jenny A soothing reading primer and cozy bedtime story. --Publishers Weekly A sweet bedtime story for tots, simply but very well done. 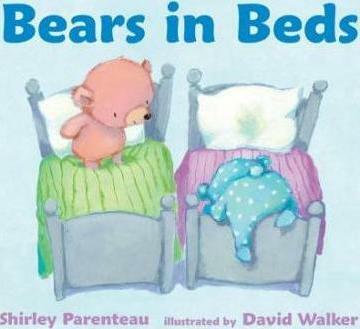 Shirley Parenteau has written a number of books for children, including Bears on Chairs. She lives in Elk Grove, California. David Walker has illustrated several children's books, including Bears on Chairs. He lives in Chapel Hill, North Carolina.